Kentucky's House speaker says someone hacked into his Twitter account to post inflammatory comments about U.S. Senate Minority Leader Mitch McConnell. Democratic Speaker Greg Stumbo took to Twitter to distance himself from the criticism directed at the five-term Republican senator from Kentucky. 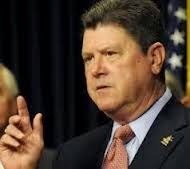 Stumbo tweeted he was unaware the anti-McConnell comments had been posted Thursday night until he was notified in a phone call. The speaker explained that his personal Twitter account had been hacked and he was changing his password. Here is what was tweeted. *To Rich Mitch you sent our young men to war which was useless how about making your military file public? The dead deserve it. *Check Mitches net worth over these years and @compare it to the average Kentuckian he gained you lost and this why he wants to be re-elected?